WinStar stallion Paynter celebrated his first winner as a freshman sire Sunday on a doubly appropriate occasion. His juvenile daughter Dark Artist did the honors in the 5TH race on Haskell Day at Monmouth, as if in homage to Paynter’s signature victory in the 2012 Haskell (G1). Moreover, on the undercard, WinStar sponsors the Matchmaker (G3), with three stallion seasons on offer, and Paynter is one of the suitors. Dark Artist, fourth on debut at the Jersey Shore July 7, went off at 12-1 while stepping up from five to six furlongs in the maiden special weight. Trained by Jane Cibelli for Goodwood Racing VIII, Dark Artist rallied strongly from just off the pace to score by 1 1/2 lengths. She clocked 1:12.32 on the fast track with Antonio Gallardo aboard. Bred by Winchell Thoroughbreds in partnership with WinStar, Dark Artist sold to her current connections for $30,000 as a yearling at Keeneland September. The Kentucky-bred bay was produced by the unraced Storm Cat mare Ominous Cat, a full sister to the dam of 2012 Breeders’ Cup Juvenile Sprint scorer Hightail. Dark Artist’s second dam is multiple Grade 1 victress Fleet Renee. Paynter jumped straight onto the 2012 Triple Crown trail despite not beginning his career until February of his sophomore year. The Bob Baffert trainee was fourth in the Santa Anita Derby (G1) in just his second start, placed second in the Derby Trial (G3), and gained more experience when romping in an allowance on the Preakness (G1) undercard. Ready for prime time, Paynter nearly wired the Belmont S. (G1), only to have Union Rags come up to his inside and collar him late. Paynter put it all together with a comprehensive performance in the Haskell, and with Kentucky Derby (G1) and Preakness champion I’ll Have Another retired, he appeared on the verge of becoming the best three-year-old still in training. Sadly, Paynter developed a fever while still at Monmouth. He was subsequently found to be suffering from colitis, and a lengthy hospital stay ensued. That battle was then complicated by laminitis. The Zayat Stable principals, Ahmed and son Justin, took to social media to give fans the latest word on Paynter’s life-threatening medical crisis. 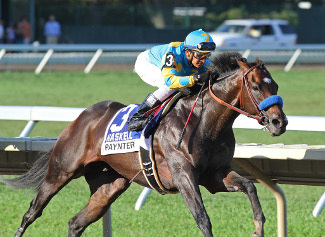 To relive the twists and turns of his odyssey, see the archived articles on Paynter. After an outpouring of prayers and well wishes, often accompanied by the hashtag #PowerUpPaynter, and his outstanding veterinary care, the brave colt began to recover. Fans voted to give Paynter the 2012 Vox Populi Award and named his improbable recovery the NTRA Moment of the Year. Ahmed Zayat mentioned the possibility of his racing again, which seemed radically optimistic at the time. But Paynter did make it back to Baffert’s barn, and eventually onto the racetrack. Paynter returned to action in a June 14, 2013, allowance over seven furlongs on Hollywood Park’s old Cushion Track, and served up a Hollywood-style script with a front-running tour de force. Although he didn’t add another stakes to his resume, he finished second in the Awesome Again (G1) (named after his sire) and the San Diego (G2). Retired to stud at WinStar with a record of 11-4-4-0, $1,101,924, Paynter may pass on his own unique blend of courage and talent to his offspring. Paynter is a close genetic relative of 2013 Preakness hero Oxbow, who also recently sired his first winner. Both are by Awesome Again out of full sisters to Hall of Famer Tiznow. Paynter’s dam, Tizso, is also responsible for Grade 3 scorer Tiz West and stakes vixen Tizakitty. The eight-year-old Paynter commands a stud fee of $20,000, stands and nurses.